Your home, like most homes today, has a variety of floor and wall coverings. Tile – and a wide range of stone – now covers more than just your bathroom floors and your tub and shower walls. Tile and stone floors have become popular surfaces in foyers, kitchens, utility rooms, family rooms, porches, and many other areas, both inside and outside of the home. Like any other surface, these areas require ongoing daily, weekly, and/or monthly maintenance in the form of vacuuming, sweeping, mopping, and scrubbing. However, a toothbrush, some consumer–grade cleaners, lots of elbow grease, and a few hours of labor can only go so far. That's why you need the expert knowledge and professional care and service that New Finish Carpet Cleaning can provide! Over time, mold, mildew and dirt take residence in the porous surfaces of your tile, stone & grout. Our cleaning solution penetrates deep inside these pores removing bacteria and other micro-organisms. Sealing your grout will help keep your tile, grout & stone bacteria free. Our professional-grade cleaning process leaves your tile and grout surfaces sparkling clean like the day they were installed. 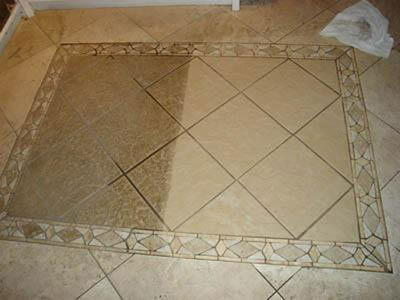 We remove the dirt and grime that builds up over time and Your tile and grout's color will be restored. We also apply a protective sealant to ensure you get the most out of the investment in your home. Professional Tile & Grout Cleaning. We can make your dull & yellow tile shiny & white again. Bring that old grout back to life and rid yourself of the stains, smells, & bacteria now by calling (706) 318-2848.